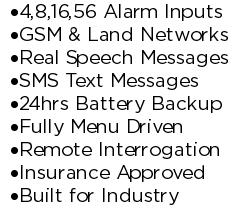 The M60 Alarm Dialer comes with many features as standard. Most are user configurable via the in built menu, others have to be “turned on” and or configured in the factory. When ordering please make it clear which features you require. Even though we try to include all the features the average user many require as standard, they may be occasions where you want the M60 to work in a different way or be more autonomous, in that case please have a look at the various upgradable optional features. One or more inputs of the M60 Autodialler can be designated as an ‘emergency channel’ and when activated it can initiate an alternative Duty Roster to alert different staff e.g. Security staff as opposed to Maintenance staff. The M60 can be interrogated (called) from any land phone or mobile phone to check the current status i.e. whether 'all conditions are normal', and to check that both the telephone line and the M60 are operational. Once the alarm message has been received the recipient can telephone the M60 Autodialer to cancel further dial outs, thus saving all personnel on the duty roster from having to respond to the call. A wide range of pagers are compatible as standard with the M60 e.g. Vodapage, B.T and Mercury pagers are all compatible. Pagers are available in a number of different formats. What is a Duty roster? - A roster is a selection of telephone \ mobile \ cell \ pager etc. numbers that the M60 will ring when there is an alarm. The rosters are selected via the Menu e.g. you might have a day roster, a night roster and a weekend roster. Where one more channels are for information only and or not required to initiate an alarm dial out, they can be hidden and the information only provided when then M60 is interrogated or where a standard (non inhibited) alarm becomes active. The pause between each dialled number can be independently programmed to suit customers own response procedures. The M60 Autodialer is pre-programmed with a ‘Input Delay’ to stop erroneous alarm calls due to momentary alarms e.g. power dips. For example to M60 must have an active alarm input for 60 seconds before it will dial out. The M60 Autodialer Provides an alarm output to signal that the integrated battery backup is about to expire. The M60 Autodialer Provides an Closed Circuit alarm output to signal that that an alarm has been activated. This is only active during the initial alarm input delay period. The M60 Autodialer can be switched on or off to stop it dialling out via its keyswitch. e.g. During the day when the M60 is not used or during onsite maintenance. Via an optional extra we can provide automatic timed isolation via software. A user can record in real speech a bespoke alarm message for every individual alarm channel and also a universal site identification message. So for example instead of getting “channel 6 alarm” you would get “This is acmes main site, generator on shed 2 alarm”. The M60 Autodialer comes with a integrated Battery backup as standard. This allows the M60 to continue to function for around 24hrs - 36hrs depending on conditions. The M60 Autodialler is the only Alarm Dialer on the market that is approved to dial 999 to call the Police or Fire services. We can also supply optional additional telephone and electrical surge protection. The M60 Autodialer comes with 4, 8 or 16 digital inputs as standard, this can be increased up to 56 digital inputs with the M60 ADE Panel. Digital inputs are volt free change of state/switched inputs that can be either normally open or normally closed, inputs can be momentary or latched.